A monster update of two passing out parades and a lot more!! 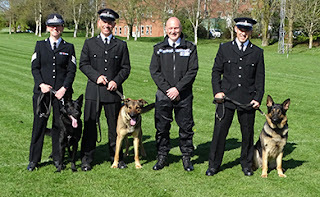 From left to right are Sgt Ali Cruwys with Police dog Lenny, PC Steve Cruwys with Police dog Nato, Course Instructor Hugh Watson, and Mark Pomery with Police dog Ronnie. They are pictured here on the day of their passing out parade which took place in front of all their friends, relatives and puppy walkers at HQ Middlemoor. This was the culmination of 13 weeks of intense training under the supervision and Instruction of Hugh Watson. 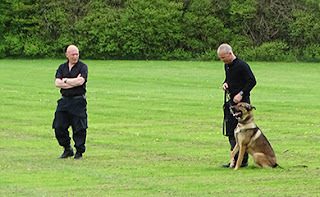 In the final week the teams underwent an independent 2 day assessment by Gloucestershire Police dog Instructor Phil Powell. They had to demonstrate that they had the skills, control and temperament required of an operational Police dog team. Here are the teams pictured after successfully achieving their operational Police dog licenses. 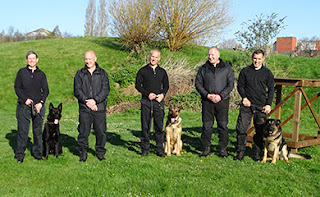 From left to right are Ali & Lenny, Instructor Hugh Watson, Steve & Nato, Assessor Phil Powell, and Mark with Ronnie. Phil is a very fair assessor who understands the pressure the handlers are under and always puts everyone at ease. The assessments were very fair and achievable taking into account that the handlers are always nervous and the dogs pick up on this. 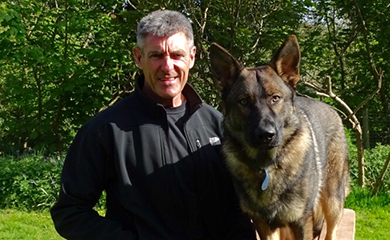 Phil may be fair but he likes a dog to show the necessary mental resilience and toughness required of a Police dog. Here he is at the front of an unruly crowd making sure that Nato showed the level of courage necessary to deal with such a crowd. In addition to dealing with violent disorderly crowds the dogs have to deal with armed criminals. Nato may be an easy going guy but you really don’t want to upset him. He is pictured here about to teach the criminal with the stick that this was a bad choice. Afterwards Steve is debriefed by Phil on their performance. We know that Nato gets excited with his criminal work because his ears come up. 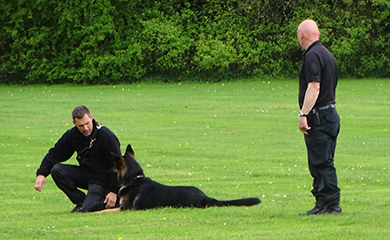 Here is Lenny detaining a criminal armed with a gun. 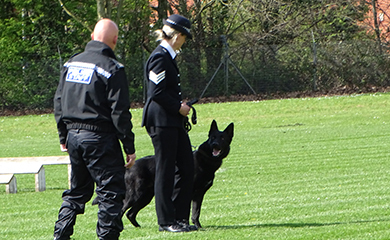 Fortunately now that a significant number of operational officers ( Including dog handlers) carry Tazor stun guns we rarely need to use the dogs to deal with a criminal armed with a weapon. 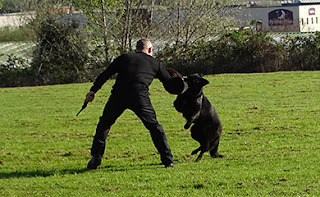 No dog handler ever wants to send a dog to deal with someone brandishing a bladed weapon because the dog has no concept that he/she could impale themselves as they rush in. The dogs are also trained to chase and detain a fleeing criminal. 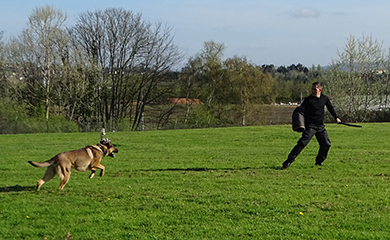 They are also trained to recall back to the handler even if they are in the middle of chasing a criminal. This is in case the dog is in danger such as the criminal running towards a busy road. 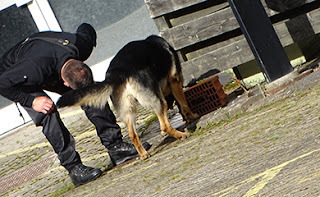 If the criminal stops running and gives up the dog should not bite but keep him/her under surveillance preventing their escape until the arrival of the handler. 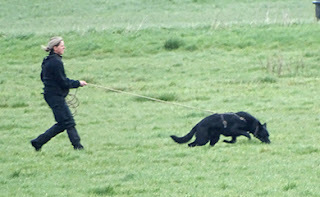 Most of the work of the dog team involves tracking or searching for outstanding criminals or vulnerable missing persons. 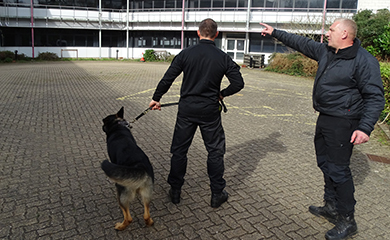 Also on the assessment the teams have to search a large open area or buildings or a combination of both to locate 2 outstanding criminals or missing persons. 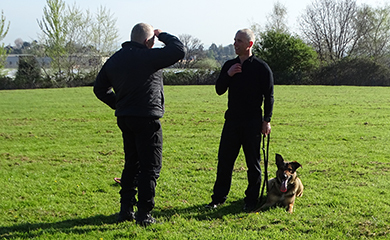 Here is Ronnie having located a criminal hiding up a tree. 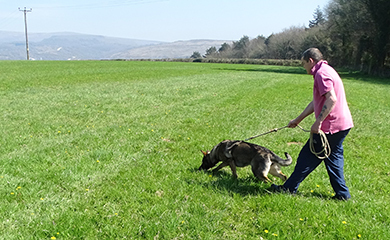 Locating outstanding property or articles is also a regular area of our work and on the assessment the teams are given an area where they must locate 4 hidden articles. Here is Mark and Ronnie being given their area by the assessor. Ronnie is pictured giving a clear indication he has found something in a concrete block. 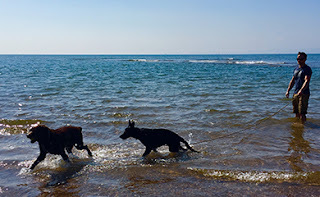 The dogs must give a passive indication and not touch the article so as not to damage any potential DNA on the article. Control is the bedrock of all of the exercises performed by the dogs and focus on the handler builds the control and also the bond. Here are the teams working on their focus work. 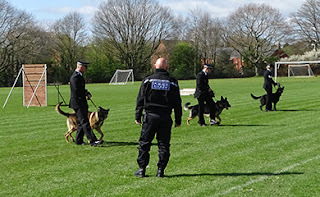 Having successfully completed their assessments the teams prepared for their passing out parade on the final Thursday. 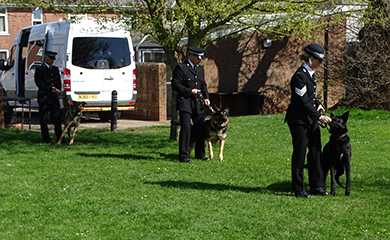 The passing out parade gives the chance for friends and family to see the teams pass out but most importantly it gives the puppy walkers the chance to share the day with their dogs and their handlers. 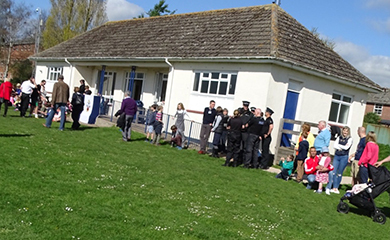 The weather was superb and we had an amazing turnout. Here are the teams preparing to march on and present themselves for their introduction and display. 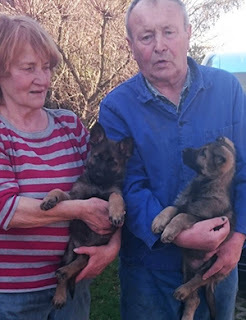 They are currently puppy walking Tara and have been puppy walking for many years. 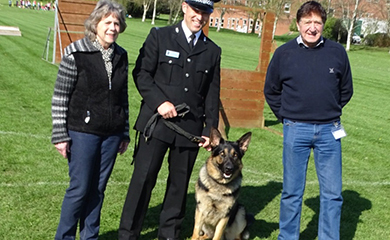 Terry and Jill Hodge with Mark and Ronnie. 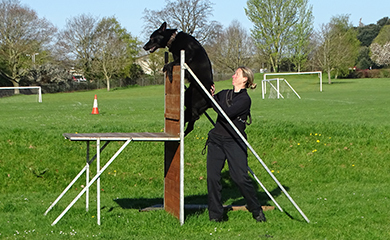 Ronnie was bred by Alfons Schumeister in Germany and he also bred Tammy, Tag and Tara who are on our January 2018 Initial course. 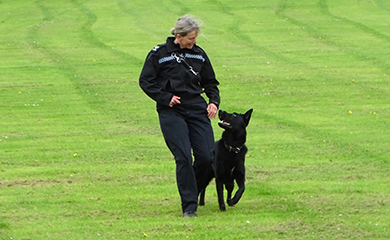 Susannah has also been a regular puppy walker for the force. 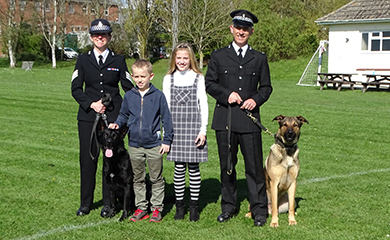 Nato was bred by Drew Rush along with his 3 litter brothers Dexter, Riggs and; Reggie who all graduated in December 2016. Me with Lenny and Ali. 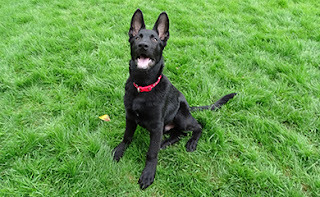 I imported Lenny at the age of 15 weeks from his breeder Arndt Muller in Germany. 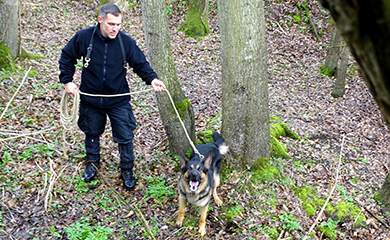 Arndt Muller and his father Werner Muller have bred many famous tracking dogs going back many years and in Lenny we have certainly obtained a dog of exceptional tracking ability. Lenny has lived with me for 18 months and I will miss having him around. But he will be doing what he was bred for with Ali and I know she will make sure he gets plenty of work. 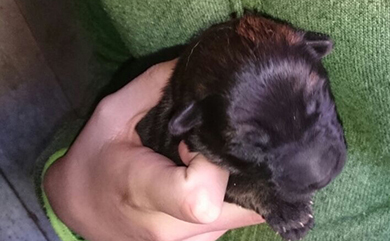 Lenny’s mother Quira has this week whelped 3 pups and we have booked a male pictured here 1 day old. Hopefully he will follow in Lenny’s footsteps. Mark and Ronnie are pictured here with Mark’s family and will be based at Camborne. 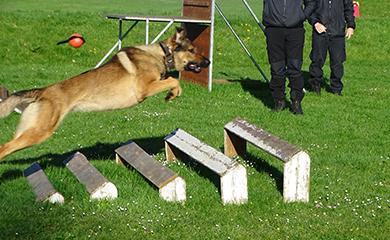 and then Steve showed the crowd just how agile Nato is on the agility equipment. 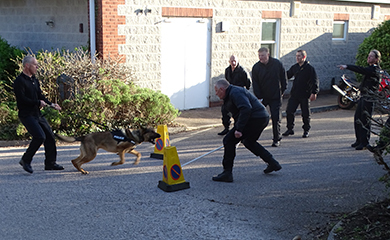 All 3 teams concluded with individual criminal work exercises. They didn’t go exactly to plan but they never do because the passing out parade is the first time the dogs have performed in front of a crowd and there is plenty of time in the months ahead to put in the polish. Good luck to the teams as they start their careers in the real world. Pictured rear left to right are Tammy, Tag and Tara who have just turned 7 months. Front left to right are Ozzie, Ollie and Oscar who are just over 4 months. 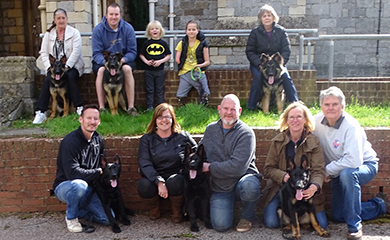 These 6 puppies are for our January 2018 Initial Police dog course. Although the pups are quite young I decided to assess the reaction of the pups on all of the various shiny floors and different types of stairs at the old Exmouth college. I also introduced some loud and unusual noises to see how strong their nervous systems were. 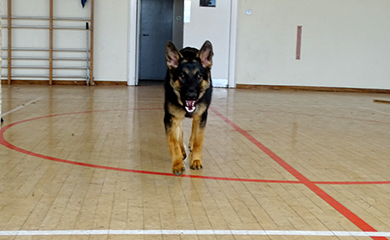 Here is 7 month old Tammy completely comfortable on the Gymnasium shiny floor. Her sister Tara was equally at home. The ropes are on a series of overhead pulley’s which spook a lot of dogs because of the overhead noise they make. 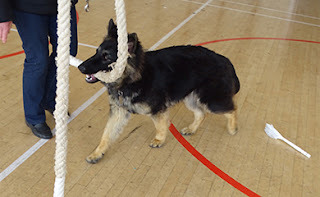 Ozzie didn’t look up he was so engrossed in winning the tug of war. None of the photo’s could be used from the other areas of the building because of the poor lighting. All 6 pups performed extremely well and there were no signs of any nervousness to any of the noises or any sign of phobias with shiny floors which is such a problem with German shepherds. The problem of an aversion to shiny floors doesn’t usually manifest itself until the pups are over 12 months of age and no one seems to know why it happens although there are lots of theories. 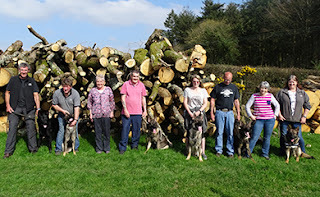 This group of pups are all off to the farm for a visit next Sunday which I am really looking forward to. Ozzie started off with Marie and her family and everything went well for 2 months until the issue of him nipping Marie and the kids became too much of a problem. ( Show Pic 36) I decided after watching him nipping her legs when she tried to walk him that there was potential danger if he did this while crossing a busy road. This problem did not occur with her husband Wayne who is much more assertive in his approach. Reluctantly I decided to remove him and find an alternative puppy walker. I re-homed him with Chris and his 13 year old Labrador Wellington. 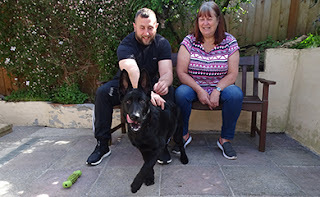 All seemed to be going well but the problem of him nipping his partner and young son resurfaced and so I rehomed him with my most experienced puppy walker Lyn Parlour. Needless to say everything is going well and I do not anticipate any further issues as Lyn has looked after over 40 dogs for us over many years and Ozzie has already worked out that Lyn is definitely in charge. I would like to thank Marie for the work she did with Ozzie and also Chris. 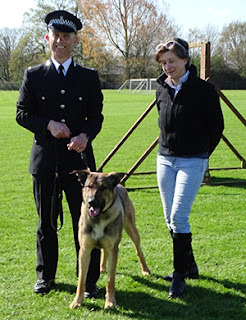 I will make sure that they are kept fully up to date with Ozzie’s progress. 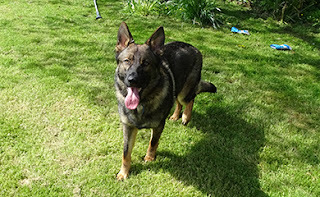 There is nothing wrong with Ozzie other than he is a very strong willed determined puppy who needs an experienced and consistent approach with firm but fair leadership. It is no reflection at all on Marie and Chris and although both have experience with big dogs both commented that they had never come across dogs like this. 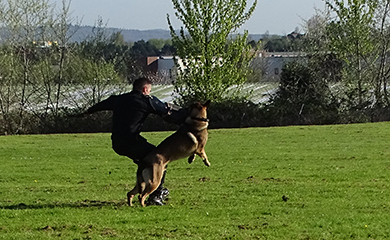 The type of puppy that possesses all the attributes to be an outstanding Police dog usually is a handful in the early months but they do grow out of these biting phases. All the usual advice like distract with a toy or scream out loud or put the pup in his cage rarely works with some of the type of pups we have. If you look at the 2 pictures of Ozzie when he came back to me you will notice that he does not even attempt to steal Sasha’s toy even though he desperately wants to. I can tell you that Sasha did not achieve this respect by the use of a clicker, titbit or polite request to leave her toy alone. He tried it once and as tough as he is he quickly realised it was not in his interests to do it again. 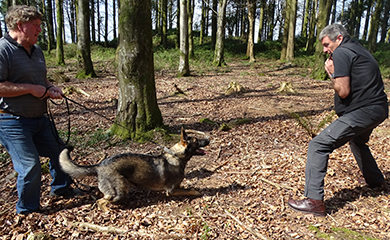 I must emphasize that we would always initially use non forceful methods to achieve a result with all of our pups but occasionally a pup like Ozzie comes along and a stronger approach is needed. 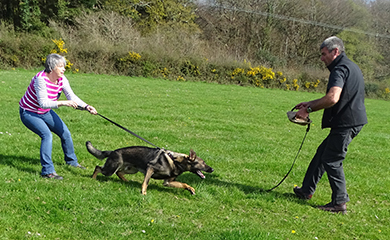 We clearly don’t expect our puppy walkers to employ this approach and with such pups they need to be allocated to a very experienced puppy walker. 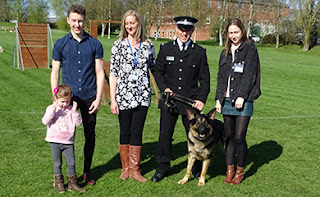 I am sure Ozzie is going to be an outstanding future Police dog whichever handler ends up with him is going to be very lucky indeed. Here is Rudi and the D litter on our last Sunday training day where we prepared for our forthcoming assessments in June which will determine which dogs will be selected for the September 2017 Initial Police dog course. From left to right are Rudi, Dizzy, Donna, Devon, Danno and Duke. 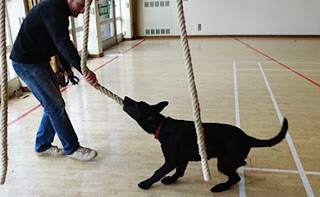 We practised our tracking, article searching, introduction to person searching, and basic biting work on a bite cushion. 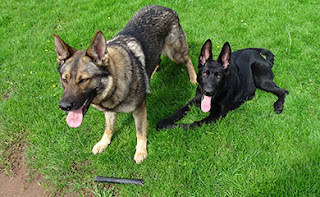 The only absentee was Daisy because puppy walker Eamon is on holiday. Here are Donna, Devon, Dizzy and Duke all enjoying their training. With the exception of Duke everyone is progressing very well in all elements of their work and the development of their characters. 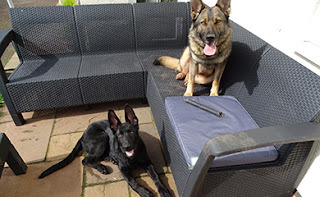 Duke has no inclination to join in any work whatsoever because he is clearly unhappy working in and around the other dogs and is very clingy to his puppy walker Lyn. He is now started to gain confidence and loves running and interacting with Rudi. 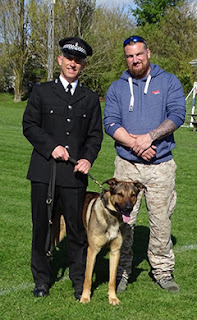 I will assess him over the next week and although I don’t think he has the general confidence to be a Police dog I will give him every chance. In my early years of assessing dogs I would have instantly retired him but experience has taught me never write them off because sometimes they can just surprise you. 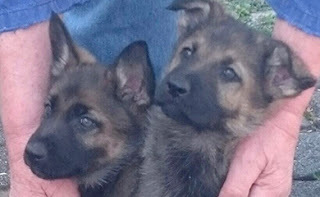 Argo from the A litter and Cosmic from the C litter are case in point. 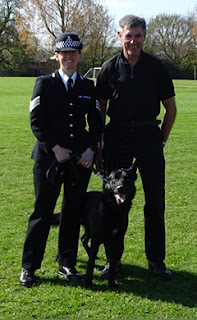 Both were nervy and unsure as pups but both are now licensed Police dogs. Duke has impressed me with his work ethic in the last few days. 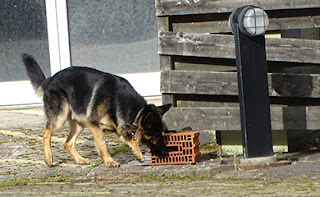 His tracking, article searching and tug work is extremely good. 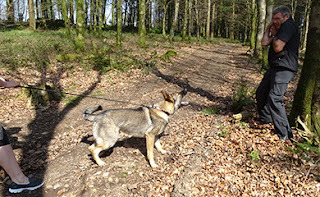 His tendency to launch at other dogs has all but gone and he is becoming much more confident. Early days but excellent progress so far. I will let you know how he gets on in the coming weeks. I hope to invite the owners of the 3 pups we had to sell from the D litter to join the rest of their 6 litter mates for a character assessment within the coming weeks. This would give me an accurate picture of how successful the litter have been and whether to have another litter from Sasha in August this year. From Duke and me Bye for now.